Kelsey Rauber is a really great friend I made in a TV writing class 2 years ago. She was a PA/helping pair of hands for “Come Here Often?” and will be for Summit as well. She officially became a CongestedCat team member when she and I decided to collaborate on a currently untitled comedic webseries that we will produce next year. She has also written a comedic feature film, About A Donkey, that is quirky, filled with heart, and lots of quippy fun. 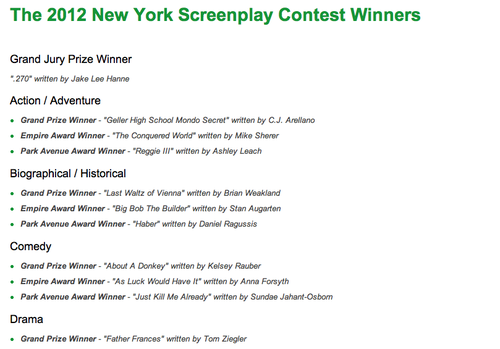 She submitted it to the New York Screenplay Contest and it was selected as Best Comedy Screenplay! We’re so excited for her and I personally can’t wait to get started on our webseries. And, I have to admit, I’m definitely keeping that feature of hers in the back of my mind; there’s a chance I might be ready to take on my next feature once Summit’s finished! Once again, Congratulations to Kelsey!